Restoration of Israel's relationship with God. God rejoices. Abundantly! Traditional / ATA 124 / SLW42 / UMH494 / GtG472 / PH338 / W&R487 / Cha590 / PfAS079A Kumbayah, my Lord (African American Spiritual) I think this song is really beautiful sometimes. Sometimes it’s really awful too, unfortunately. You can judge whether it will work for your congregation. You could also sing "Come by here, my Lord" too. Wish I could find a nice sample for you, but can't. Online Resource / Tune In / NCYC '07 Forgive us now (Dave Brown) An excellent ballad. "Forgive us now, O mother love for all the idols we have built, For all the time we’ve worshiped there in company of dark despair. Forgive us mother of all hope”. Free downloadable songbook, sound samples, lyrics. *MV020 God of still waiting (Carl Daw) Good words about God waiting for us and the promise brought by the Spirit. The tune is quite beautiful, and will need to be taught at least a little. Lyrics. AoVK-124 Shout to the Lord for joy all the earth (Nathaniel Ford) A fun three part song. I found it hard to find a song that would be appropriate for kids for this reading, but thought that the idea of not keeping silent, and speaking out might be a good theme. Perhaps this song would fit. Good for kids. StJ / GC(II)670 / G(3)772 How Can We Be Silent? (Michael Mahler) An energetic song about speaking up about the good news of Christ. The refrain can also be used as a round, so you could do both, or just use the refrain if you want something simple. Sound sample. Sheet music sample. Good for teenagers, or for kids if you use only the chorus. AoVK-44 / GGives1 / StF614 God loves you and I love you (Traditional Togo and Ghana) Good old kid's song, probably very tacky, but it's good for littlies to know that God's loving. AoV version is good. Good for little kids. Online Resource / Tune In: All will finish well (David Brown) "You, in all our darkness, you offer peace.”…. a simple anthem of hope. Free downloadable songbook, sound samples, lyrics. MV214 May God's sheltering wings (Judith Snowdon) A nice simple blessing and benediction, which may be sung about a feminine or a masculine God. Lyrics. Video with actions from BUC. *Music by Heart 62 God your people seek shelter (Ruth Cunningham) A nice repeated one bar ostinato (a-ah) with a short refrain for the congregation to sing in response to a cantor part. That explanation sounds it sound complicated but it's not. It would be good to involve kids in this. Good for kids. *VU762 Your steadfast love O God (Eleanor Daley) A very simple Psalm refrain that would work well with children. You can use Psalm refrains to keep the children's attention if you have an appropriate tale to tell. Good for kids. TiS 558 / NCH100 / CH223 / UMH682 / VU440 / GtG675 / LBW278 / ELW565 / CP025 / CP(E)14 / PfAS1046 / URW213 / 82Hml-043 / StF142 / MP176 All praise to thee my God this night / All praise be yours my God this night / All praise to you O God this night / Glory to you my God this night (Thomas Ken) A classic evening song. Translations vary widely so make your own decision - NCH is the most inclusive. Lyrics & sheet music. Oldy-but-a-goody. *PfAS036A How precious is your unfailing love (David Lee) A quite contemporary and lovely Psalm refrain. It would also work as a (longish) response to intercessions. Sound sample (Youtube). *CH242 Is this the way you made the world? (Douglas Gay) Wow! This song has a great tune, and wonderful wondering words. 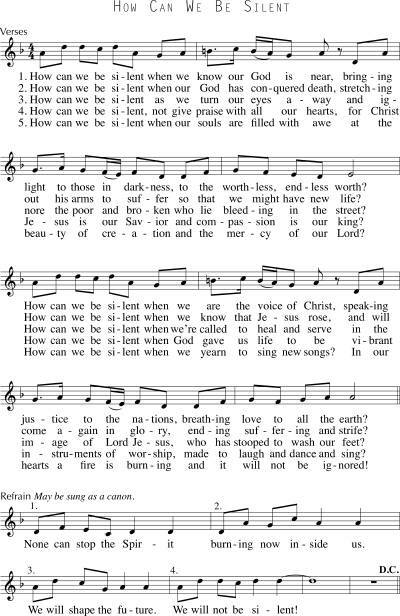 PfAS036B High in the heavens eternal God (Isaac Watts) Good hymn to a familiar tune with quite inclusive lyrics, and only one old fashioned word. Lyrics. Iona (Heaven Shall Not Wait) When our Lord walked the earth (John Bell) Familiar and easy tune, excellent words. Chorus is “God became our neighbour, granting with his fabour, Power to speak and heal, grace to know what’s real, wisdom, insight and faith, love and understanding.” New words to old tunes. TiS 671 / AoV2-121 Made in God's Likeness (Patricia Lewis) Excellent Australian imagery. This is one of my very favourite songs. It is not difficult if you have a good musician at the helm. If it is new to your congregation, they will be able to join in on the verses by the time you get to the 3rd one. The change in tone with the verse really lifts this song. Good for older kids. TiS 421 Where the Spirit is there's freedom (Per Harling) Fun and good; excellent fun for the pianist! Lyrics. Good for kids. Can be sung with the congregation in two halves singing each part, which is not too hard once they have the hang of singing it in unison. I cannot understand why this is not in other common hymnals! Lyrics. TiS 412 / AHB 324 / ATE 251 / G(II)328 / GC468 / CP651 / W&R130 God sends us the Spirit to befriend and help us / Spirit Friend (Tom Colvin & the people of Malawi) I like this song, but the lack of inclusive language for God in some versions drives me a bit crazy. In Tom Colvin's book "Come Let us walk this road together" he uses more inclusive language. That is, he writes “God sends us the Spirit” instead of “God sends us His Spirit” and "Spirit of our Maker" rather than “Spirit of our Father”. Lyrics and sheet music. Online Resource / Tune In Spirit of the Father / Alive in me (Sheree Anderson) Catchy boppy pop song about God's spirit within us and within the world. Free downloadable songbook, sound samples, lyrics. AoV1-130 / NCH444 / SFFS 2223 / HPP495 / GtG300 / G(II)533 / GC735 / GC(II)728 / G(3)835 / W&R595 / Cha494 We are one in the Spirit / They’ll know we are Christians by our love (Dan Scholtes) A classic 60's song of unity and being an example to others. It's still pretty groovy, I reckon. Older version are really masculine. We often syncopate it a bit at Brunswick. Note that the 3-6 Sunday School class learned this song this term, so would be good to use. Lyrics and pretty silly sound sample. Good for kids. Online Resource / Tune In We will sing a new song to the world (Dave Brown) An energetic song about the gospel, about singing all the new tunes and rhythms that God provides and creating a new earth. A good sending-out song. Free downloadable songbook, sound samples, lyrics. AoV1-071 / GA530 / GC(II)742 / G(3)837 / Lau462 Gather Your People (Bob Hurd) Excellent eucharistic theology. Sound sample. Lyric and sheet music sample. 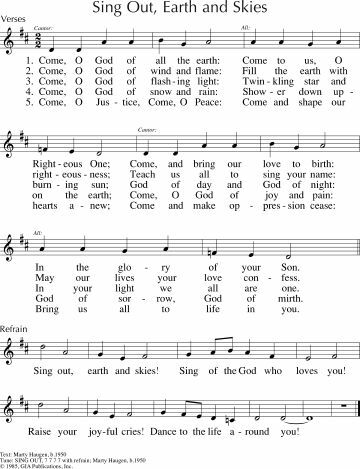 TiS 411 / AHB 328 / NCH266 / UMH537 / VU194 / A&M633 / CP658 / CP(E) 425 / W&R331 Filled with the Spirit's power (John Peacey) Excellent inclusive words to a very well known hymn tune. I prefer it sung to WOODLANDS. Lyrics and sheet music. Oldy-but-a-goody. AoV1-129 / CH665 / UMH620 / VU467 / ELW701 / HPP525 / A&M461 / GtG530 / G(II)599 / GC830 / GC(II)813 / CP073 / W&R689 / Cha393 / Lau832 One bread, one body (John Michael Talbot) A classic. Don't play it too slow or it takes forever!! Particularly appropriate if you are celebrating communion. MV141 We are all one people (Joseph & Violet Naytowhow) This Native American song really gets stuck in my head. I think it's really good. Might take some work to get your congregation going with it, though. Sound sample & story. GtG768 / StJ / GC(II)645 We Are the Body of Christ / Somos el Cuerpo de Cristo (Jaime Cortez) Bilingual verses and choruses. Will be good for a congregation where both languages are spoken. Sound samples and sheet music. 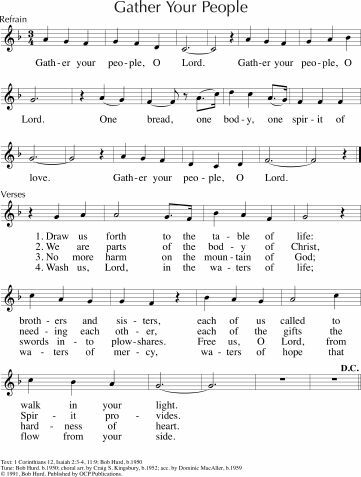 AoV1-086 / G(II)530 / GC733 / GC(II)727 / G(3)834 We are many parts, we are all one body (Marty Haugen) I like the chorus much better than the verses, but they are really okay too. The chorus would work on its own. The sound sample at Hymnprint is horrifically slow, but look at the sheet music there. MV177 This is my body naked before you (Daniel Damon) Excellent words about Christ's body being both the broken people, and we who can help the broken. The tune is not easy. Maybe best sung by a soloist at first. LBW648 / ELW312 / CP437 / A&M102 / W&R669 / SP28 / URW085 Jesus come for we invite you (Christopher Idle) Excellent words to a well known hymn tune. This picks up themes of the Wedding at Cana, the transformative power of Christ to energise our faith. "Jesus,come! surprise our dullness; Make us willing to receive More than we can yet imagine, All the best you have to give: Let us find your hidden riches, Taste your love,believe,and live!". It's set to the tune UNION SEMINARY, which is not in that many hymnals. You could also sing it to WESTMINSTER ABBEY (TiS 432) or to SICILIAN MARINERS. Lyric and sheet music New words to old tunes. AA027 Come to the celebration (Marnie Barrell) Joyous simple tune (CANA) and great words of the feast at Cana, the bridegroom's invitation. ATW 447 Thank you Jesus for ordinary miracles (Robin Mann) Sometimes I like this song, and sometimes I don't. Maybe you'll like it for this week. Fun tune. Lyrics. Good for older kids. Online Resource In Cana at a Wedding Feast (Carolyn Winfrey Gillette) Good story-telling words to the tune ELLACOMBE. New words to old tunes. Iona (T1AU) / MV166 / URW425 Jesus Christ Jesus Christ son of God among us (John Bell) A simple short song. Good for the Christmas season. Good for kids. CH336 / A&M97 / SP26 Christ is our light! the bright and morning star (Leith Fisher) Good words to the tune HIGHLAND CATHEDRAL. Majestic. New words to old tunes. Recorded Music The Wedding (Michael Card) This is quite a pretty folksy song. I think it would be nice to sing the chorus only (rather than playing the recording), either at speed for a celebratory song, or more slowly and reflectively. I really like the line "Turn the water of lifeless living to the wine of gladness we pray". Youtube. Lyrics. "The Trumpets Sound, the Angels Sing" by Graham Kendrick showed up in my Glory to God hymnal (#505). I had never heard of it so I listened to a video of it and am now in love with this song! Water to wine is referenced in second verse. It's a perfect communion song too. And it has rhythm!! https://www.youtube.com/watch?v=EInhWe8036c has a good video with lyrics. Johnny Cash did a song "Water into Wine" at the San Quentin Prison.